MP4 might be one of the most used file formats in our multi-media life. However, you will find a painful experience to import MP4 movie files into iMovive for further editing. Fortunately, there is an easy way to fix this issue. Let’s find it out here. iMovie says it supports MP4, but not all. Actually, this is due to the MP4 files codec: iMovie prefer MPEG-4 and H.264 codecs instead of others. So if your MP4 files are not compatible with iMovie, it’s probably because of the video codec incompatibility. On this occasion, an easy option is to convert MP4 to iMovie accepted video codecs and then transfer the result videos to iMovie. For transcoding MP4 to iMovie, the best program I can recommend is Brorsoft Video Converter for Mac. 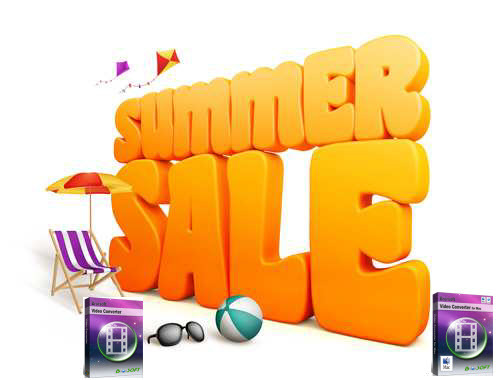 It’s an easy-to-use yet powerful high-quality video converter, player and editor. And it can handle videos in all formats, including MP4 format and make them best suitable for iMovie (iMovie 11/09/08) quickly and easily. What’s more, this app also provides some cool video editing features like cropping, cutting, merging and so on. So no doubt, this powerful MP4 to AIC video converter will bring you an extraordinary video-editing experience. If you are facing problems when editing video footages with iMovie, FCP, Avid MC, Premiere Pro, etc. non-linear editing systems, chances are you already installed this great free utility. If not, download it from here. So, how to convert MP4 files for editing in iMovie? Below is how. 1. Launch the MP4 to iMovie Converter, and then import MP4 clips through “Add Video” button or “Add from folder” button. 2. You can choose iMovie/FCE — > Apple InterMediate Codec(AIC) (*.mov) as the output format. The output video can be imported to iMovie 11/iMovie 09/iMovie 08 directly. 3. You can adjust video and audio parameters, including the Bitrate of Video and Audio, the Codec of Video and Audio, Video Size, Sample Rate, Frame Rate, Audio Channels, etc., in the Profile Settings. 4. When everything is OK, press “Convert” to start MP4 to iMovie conversion. Once the process completes, simply click “Open” button and you can locate the result videos ready to be imported to iMovie for further editing. A new install of Premiere CC on my new computer OSX 10.9.3. Normally, I would like to use Premiere Pro to edit some recordings, in order to get better videos files. But I’m having issues with Premiere Pro CC, I cannot import .MOV files created with my Canon 5D Mark II. If I try to import MOV to Adobe Premiere Pro CC, I get a very generic “File format not supported” error msg. After a long time research, I finally find a possible method that can solve the problem. Solution 1: Try downloading QuickTime if not already installed. I installed the QuickTime and also re-installed PP CC & restarted, but NOT work. It still gave me an error. Solution 2: There are more than one guys online recommend to convert MOV to Premiere Pro CC more edit-friendly video like MPEG-2. The basic reason is that Adobe Premiere Pro might not work with some MOV files sometimes due to the codec issue. I’ve tried it and found this is really an easy and effective way. So I will share the step-by-step guide on converting MOV to Adobe Premiere CC supported video formats in the following paragraphs to help those who are in the trouble out. First you need to download Brorsoft Video Converter for Mac, a powerful and fast high-quality video converter, player and editor. It does a good job in converting .mov to Adobe Premiere Pro(CC/CS6/CS5/CS4) most compatible format MPEG-2 with least quality loss. Plus, it supports encoding camera shootings in different formats (MP4, VOB, MKV, MTS/M2TS, XAVC, MXF, etc.) to video editing software compatible file types, i.e. MPEG-2 for Premiere Pro, DNxHD for Avid Media Composer, ProRes for Final Cut Pro… to meet your different needs. If you are on Windows, Brorsoft Video Converter is the choice. 1. Run the best MOV to Adobe Premiere Pro Converter, and click the “Add” button to load .mov videos. 2. Click “Format” pull down list to select Adobe Premiere/Sony Vegas> MPEG-2(*.mpg) as the best video format for Premiere Pro. WMV, MOV formats are the good choice as well. 3. Click “Settings” to fix the frame rate, bitrate, video size, etc to your needs. To have a smooth editing with Adobe Premiere Pro, you need create the files with the appropriate resolution and frame rate that matches your source footage. 4. Click “Convert” button to convert MOV to Adobe Premiere Pro CC. Once the conversion done, you can click “Open” button to get the output files effortlessly. Now you have got it right, just to import and edit MOV files with Premiere Pro CC at ease. Once you have tried to import MP4 to Sony Vegas Pro to make your own masterpieces, you may get disappointed because we find not all MP4 files can be supported by Sony Vegas well. Personally when I try to import .mp4 file into Sony Vegas Pro only the audio is visible. What I need is to directly find a proper codec that Vegas can handle or convert MP4 to Sony Vegas compatible video codec. In my first try, I Installed the K Lite Codec Pack some guys recommend. I think it is a possible solution. But I found it blindly installs all kinds of components (not just codecs), many of which are not compatible with each other. And it does not uninstall cleanly. I didn’t like the way. In the later try, I applied the video app I’m using Brorsoft Video Converter and encode MP4 to MPEG-2 for editing in Sony Vegas Pro. When I drag the result videos into Vegas, it imports and can be edited smoothly. Now, I will present the step-by-step guide on converting MP4 to MPEG-2 for Sony Vegas Pro 10/11/12/13. P.S. Brorsoft Video Converter review: It does a good job in converting .mp4 files to Sony Vegas Pro most compatible format like MPEG-2 with least quality loss. Plus, it supports encoding camera shootings in different formats (H.264 MOV, MTS/M2TS, XAVC, MXF, etc.) to video editing software compatible file types, i.e. MPEG-2 for Premiere Pro, DNxHD for Avid Media Composer, WMV for Windows Movie Maker, AVI to Pinnacle Studio to meet your different needs. 1. Download, install and run the MP4 to Sony Vegas Converter; click “Add Videos” icon to load your source videos. 2. Hit the “Format” bar and select “Adobe Premiere/Sony Vegas > MPEG-2 (*.mpg)” as output format on the drop-down menu. It ensures the smooth editing with Sony Vegas Pro. 4. Hit the convert button, it will start converting MP4 for importing to Vegas Pro immediately. Soon after the conversion, just click “Open” button to get the generated files for natively editing in Sony Vegas Pro perfectly. We usually saw Avid users encounter importing issues when attempting to edit VOB files with the program. Let’s work with the question on the VOB and Avid MC compatibility. The main reason why you can not transfer VOB video files from to Avid Media Composer, incuding MC 5/6/7 is that Avid still can’t recognize VOB format. As far as I know VOB is basically a MPEG-2 video file which is stored in Video_TS folder in a DVD. As this kind of video file usually contains one or several audio tracks and subtitle tracks that are multiplexed together into one stream form, it is not so easy to playback or edit. If you’re in such a situation, there is an easy way to fix the issue. Since DNxHD is the most compatible codec for Avid which ensures maximum editing quality and efficiency, the common practice for VOB to Avid Media Composer workflow is, get a VOB to DNxHD Converter and transcode the .vob files to DNxHD .MOV, which will save you both time and trouble, and all you need is to drag the result videos for prompt editing. Now I will share a way to convert VOB to Avid format using Brorsoft Video Converter for Mac. You can learn the details. Step 1: Download, install and run the VOB converter, and then click the “Add” button to load the .vob videos. You can also use the drag-and-drop method to load the media files to the application UI. The program is an easy-to-use yet professional app which can be used as a VOB video converter under Mac OS X 10.10 Yosemite, 10.9 Mavericks, 10.8 Mountain Lion, 10.7 Lion, Snow Leopard 10.6, Leopard 10.5. It is free, clean and safe to install and use. With it, you can effortlessly transcode VOB to DNxHD for Avid MC, AIC MOV for iMovie 08/09/11/FCE, Apple ProRes MOV for Final Cut Pro X/7/6, etc. and it works well and converts flawlessly. For Windows users, please turn to Brorsoft’s Video Converter. Step 2: Click Format on the main interface and choose “Avid Media Composer > Avid DNxHD(*.mov)” as output format. The output video can be imported to Avid Media Composer of editing natively. Tip: Click the Settings icon to adjust video and audio parameters on the Profile Settings as you need to the best quality video. Step 3: Click the “Convert” icon under the preview window, and the Mac VOB to Avid Converter will start converting VOB to DNxHD for Avid Media Composer on Mac. Once the conversion process finished, click “Open” button to get the exported files for Avid Media Composer. Now you can edit the VOB videos in Avid MC 5/5.5/6/7 without problem. Ever met any trouble while working with your AVCHD files? I’m having a bit of a problem finding a way to convert MTS files to ProRes from my Panasonic camcorders to edit in FCP 7. At the moment, I have been using two applications to convert the AVCHD files, Toast and ClipWrap but neither of these applications seems to do what I need them to do for some projects (some projects do not require the 5.1 audio). The AVCHD files are 50fps (camera fixed) with 5.1 audio and the particular projects I am working on are 25fps and I would like access to all the 5.1 channels for audio mixing down to stereo but I need one of the 5.1 channels in particular. If I use ClipWrap, I get 5.1 audio but the 50fps is converted to 25fps by slowing the video down by 50%. If I use Toast, I get proper 25fps video (by eliminating every other frame) but the audio is two channel stereo. I can actually see the options for multichannel audio but they are greyed out. Can anybody please tell me how I can get what I need, please? Either 25fps video at 100% speed using ClipWrap or 5.1 audio using Toast or recommend another application which does this. Seek for the tech support from Apple forum, some guys offered possible workaround to me. A. You might consider looking at more current, up to date editing software that’s more compatible with the current camera you are using. FCP 7 is 5 years old…discontinued 3.5 years ago. So you might want to look at FCX, or at Adobe Premiere Pro. Both will import that footage NATIVELY…no converting needed. And should give you access to the audio tracks you want. Test Result: That may seem like an option but I have been using FCP for almost 15 years. I like the workflow and although I would never claim to be anything even close to an expert, I know my way around sufficiently to do what I need to do. I have tried FCP X – I didn’t just open it up and look at it, I did an eight hour training course in two parts with hands on tutorial. I found the whole process extremely painful and counterintuitive. B. If you stick with your FCP 7, and wanna convert 5.1 audio AVCHD keeping 25fps and 5.1 audio, Brorsoft MTS/M2TS Converter for Mac seems to be workable for you. It can generate Apple ProRes .mov outputs for you with the audio, frame rate you want indeed. 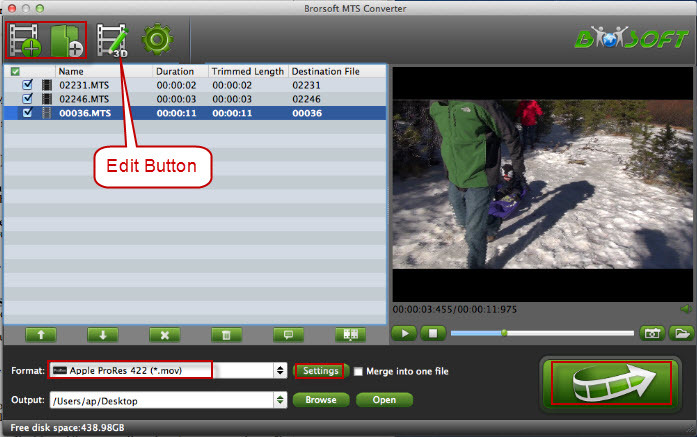 Brorsoft MTS/M2TS Converter for Mac is specially developed for AVCHD camera/camcorder users to tanscode AVCHD MTS/MTS footage to native codecs -Apple Intermediate Codec, ProRes, DNxHD and more – ensuring maximum editing quality and efficiency when working with iMovie, Final Cut Pro, Avid Media Composer or Adobe Premiere and more. What’s more, with the Mac tool, you can convert convert MTS/M2TS to QuickTime, MKV, AVI, MP4, MOV, M4V, WMV, TS, F4V, etc. with desired codec, duration, aspect ratio, and file size. 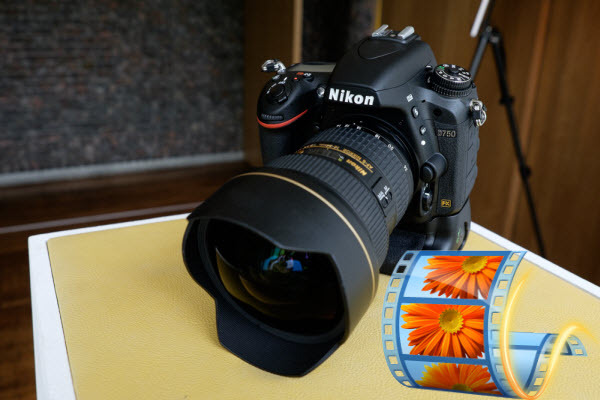 Test Result: I download and install the best MTS to ProRes Converter. It help me transcode 5.1 audio AVCHD to ProRes .mov keeping 25fps and 5.1 audio easily. When I import the Apple ProRes files to Final Cut Pro 7, a fast and smooth workflow bring to me. It really helps me solve the problem in a simple way. So, anyone who are facing the similar trouble as me, just can get some clues from this article. Good luck. Sony PMW-F55 and PMW-F5 are the two pioneers that can record Full HD XAVC clips, RAW 2K and RAW 4K recoding. 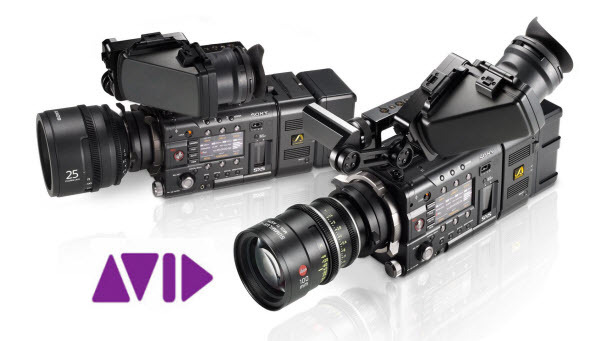 If you got a Sony F55 OR Sony F5, ever encountered any troubles when importing Sony F5/F55 XAVC to Avid for editing? This article is mainly to solve the Sony F5/F55 recordings to Avid Media Composer editing issues. Read on and I think you can get clues as you want. As many users get Sony F55, Sony F5, more problems are coming up: some of them have the need to working XAVC videos in Avid Media Composer(5/6/7), but they always meet some issues. In fact, XAVC is an open recoding format that was introduced by Sony. It allows for a wide range of content production including intra frame recording and long group of pictures (GOP) recording. XAVC is produced by two CineAlta cameras Sony PMW-F55 and Sony PMW-F5, which is not the preferred format by Avid Media Composer. You will have problem for transferring these XAVC videos even with the XAVC/XDCAM Plug-in for Avid. To avoid these problems or limit, it will be better to transcode Sony F55/F5 footage to a more editing-friendly format, such as Avid Media Composer’s DNxHD .mov. The video app I’m using is Brorsoft Video Converter for Mac, which is an easy-to-use yet professional Sony XAVC Converter Mac. With it, you can effortlessly transcode Sony’s new XAVC codec to DNxHD encoded MOV files, which will create an Avid MC friendly file format keeping the XAVC original quality. Besides Avid, this software can also export MPEG-2 for Premiere Pro, ProRes for Final Cut Pro, AIC for iMovie/FCE and more NLE systems for native editing. If you are working on Windows(Windows 8 included), please turn to Brorsoft Video Converter. Just download it and follow the tutorial below to get the work done. Run the best XAVC to Avid Media Composer Converter and click “Add file” or “Add from folder” button, browse to the Sony F5/F55 footages and load them to the converter for conversion. You can check the “Merge into one” box to join several 4K files together. Tip: Advanced video settings Click “Settings” button if you’d like to customize advanced audio and video parameters like Video Codec, aspect ratio, bit rate, frame rate, Audio codec, sample rate, audio channels. Note: If you want to get original 4K resolution, just keep the video size as original. When you finish all settings, hit “Convert” button to start transcoding F5/F55 video for Avid Media Composer on Mac. You can follow the conversion process from the pop-up windows. After the conversion, it’s freely to import F5/F55 XAVC footage into Avid Media Composer for natively editing. Additional Tips: Brorsoft Video Converter for Mac not only can encode XAVC files to Avid MC, but also enable you to import 4K, full HD, HD videos in AVI, WMV, MP4, MOV, XAVC, XAVC S, MXF, etc format to Final Cut Pro, iMovie, Adobe Premiere Pro, After Effects and more editing programs. I’m making a movie and I need to get some YouTube clips into iMovie for further editing. I’ve tried downloading Real Player, MPEG streamclip, QuickTime, and nothing seems to work. I’ve googled it a million times and finally quite get a clear, detailed, step-by-step answer. If you are also planning to import YouTube videos to iMovie, just read on to learn the tutorial I share below. What you need to do is convert the file format from.flv (flash video) that YouTube operates in to the iMovie file format of .mov. Now there are countless converters out there, both online and downloadable software. Everyone seems to have their own favorite. I’m using Brorsoft Video Converter for Mac. Except HD output quality, this video converter app is able to ensure the conversion speed. With the converter, you’ll easily convert YouTube Flash video to iMovie and import Youtube into iMovie(iMovie 08, iMovie 09, iMovie 11). This YouTube to iMovie converter can also help you convert any other video to iMovie on Mac, like avi, wmv, flv, mkv, mpg, mts, 3gp, vob, etc to iMovie on OS X. Very simple and easy interface. I have used the program for two years now. I like its stability and its ease of use. Download the program and follow the step-by-step guide. Launch this YouTube to iMovie converter by clicking “add” button to import youtube video. To save your time, you can import youtube videos in a batch. Of course, you could also import other videos to it. You can choose iMovie/FCE –> Apple InterMediate Codec(AIC) (*.mov) as the output format. The output video can be imported to iMovie 11/iMovie 09/iMovie 08 directly. Then start conversion by pressing the Convert button. And this FLV to iMovie Converter will do the rest thing for you. After the conversion, locate the converted videos by clicking the Open button. Now you can launch iMovie and then import the output files to iMovie for movie making.